TUCSON -- Luis Moreno looked strong against Sean Lenning in two games winning the Men's Open singles, 21-16, 21-3. 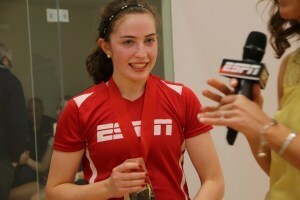 A couple of local high school athletes battled for the women's crown. Sahuaro High School's (Tucson) Kena Byrd-Jackson won the Women's singles over Marisa Maldonado of Salpointe Catholic. Kena also sang the star spangled banner at Saturday's banquet. Marine Corps Honor Guard is her back up. Vince San Angelo, a retired US Marine and tournament director, also gave a memorable talk on the meaning of Memorial Day. See the 2016 Armed Forces Tribute Tournament results HERE. TUCSON -- David Fink upset Sean Lenning in the final of the Open Singles in a strong tiebreaker performance. 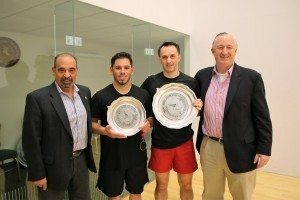 The Felix brothers, Omar and Raul, took the Open doubles. The Open players thanked sponsors for the prize money and Sportsmanship Award winner Frank Hernandez said: "I always enjoy coming here." 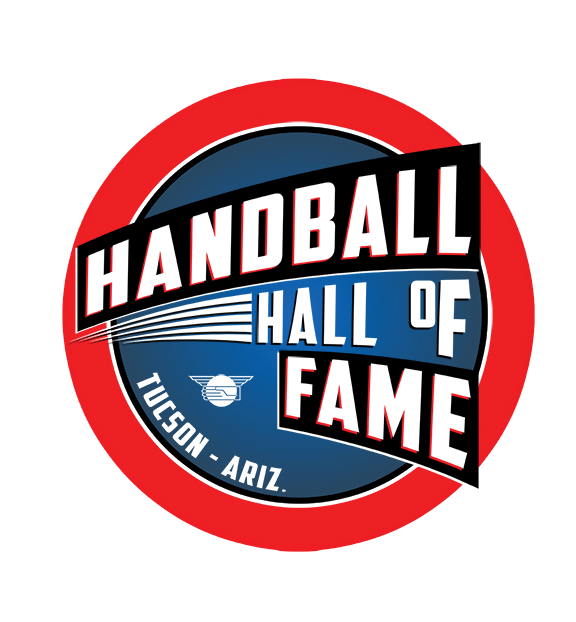 It was a great weekend of competition and camaraderie as the spirit of handball was on display in all the evenly contested fields. There was a big contingent of Fred Lewis Foundation Juniors showing the good future in Tucson. See the final results for the 2016 USHA Hall of Fame Tournament HERE. 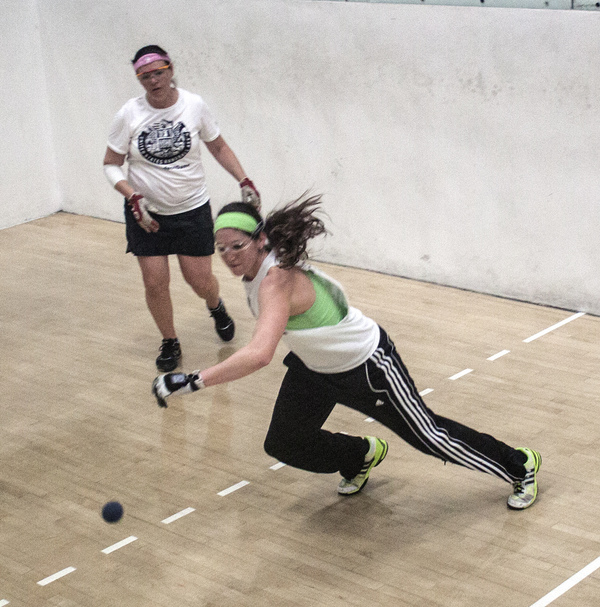 CONEY ISLAND -- After a 10-year break, the Inner City Handball Association revived the USHA/ICHA Junior One-Wall Nationals. Returning the Asser Levy Park's Seaside Courts, 60 juniors participated in the two-day event which offered skill division and drop-down play. Final draws and results can be viewed HERE. NEW YORK -- The anticipation for a Paul Brady vs. Armando Ortiz rematch reached a fever-pitch leading up to the WPH R48Pro V NYAC Stop. Could Ortiz maintain his form from Houston? Was Brady finally starting to show his age after dominating for more than a decade? Those questions and more were answered by the five-time world champion who served his way to impressive victory over Ortiz in the WPH Pro final 15-11 and 15-5. Brady never allowed Ortiz to settle, keeping the Southern Californian off-balance and out-of-sync with tough serves. The win gave Brady his third WPH R48Pro V win of the season, and it proved he's still the best handball player on the planet. Against Ortiz, Brady admitted he knew he had to play his best, attributing some "poor decision-making" from his loss in Houston. "I put a bit of pressure on myself to bounce back." Brady told WPH Reporter Kara Mack after the final. "It's obviously not getting easier. I'm getting older, and they're getting younger." Brady hopes to build on his success with two more stops to go before the USHA Nationals in June. In the Women's final, Catriona Casey looked sharp as she cruised to a two-game victory over Martina McMahon, 21-11 and 21-6. See the weekend's results and draws HERE. The World Players of Handball Foundation once again aired pro matches LIVE on ESPN and WatchESPN App. Images courtesy of World Players of Handball. FOUNTAIN VALLEY, Calif. --Mark Zamora (setting up in his first final) was one of two players to win two on Sunday. Zamora teamed with Jesse Pasos (background) and John Robles to win the 50 and 45 titles. Robles was the other player to win two, taking the 45 and 50 events. HOUSTON -- Sunday featured the R48 and SR48 finals, R48 Playoff finals and the conclusion of the Texas State Doubles Championships. AUSTIN -- Jennifer Schmitt defended her Women's Classic crown, holding off a strong challenge from Suzanne Koehler (chasing a pass), on the tough glass court at the University of Texas on Sunday. The Southwest Regionals also brought out a strong amateur field at the beautiful UT Campus. See the full write-up on the 2016 Women's Classic in the HANDBALL MAGAZINE May 2016 issue! Upper right photo show the Gregory Gym show court from 2010 Four-Wall National Men's Open Singles final.